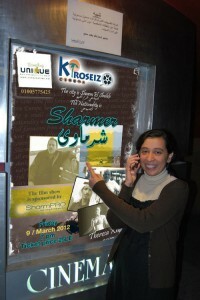 On Friday 9 March the film “Sharmer” was shown as a full length film for the first time at the Kiroseiz Cinema in Naama Bay. This is a review of the film with opinions from the audience. The director of the film, Theresa Khalil, came to Sharm 5 years ago. Its people called themselves Sharmers she discovered, but what is a “Sharmer”? This was the start of her project. The film portrayed Sharm from its early days under Israeli occupation until nowâ€¨through interviews, interesting pictures and stories. 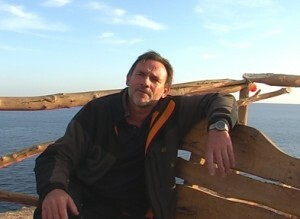 Rolf Schmidt is a German who has lived in the Sinai since the Israeli occupation and Umbarak Sobhi, a Bedouin from Sharks Bay, was born and raised here. They both gave an insight into those early days followed by a story of the first Egyptians who came to Sharm. These people were mostly motivated by the dream of escaping the big city of Cairo in order to enjoy a natural habitat. The Sinai was still a piece of desert in those times. 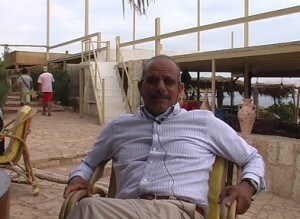 In the 90s, the fast construction of hotels in Sharm encouraged lots of people with different backgrounds to come here, mainly for work purposes. Cultural clashes became obvious due to the free life of Sharm. Girls in bikinis on the beach on one side, and Egyptian workers who came mainly from the traditional areas of Egypt on the other. A large part of the interviews depict this controversial life in a mixed cultural society. There is, for example, Aisha from Scotland who converted to Islam, and Rishka from Russia who came to Sharm to enjoy life after a career in Europe and to relax with her much younger husband. Then Ashley, who warned women not to “fall for the brown eyes”, with a bit of a smile. Those who did not attend missed an interesting evening. Who says we can’t have culture in Sharm? 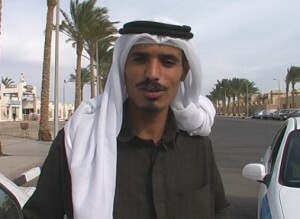 “Sharmers”” gives you a taste of the variety of people and problems faced by those living in Sharm el Sheikh. I’d love to see each “chapter” developed into a separate episode (a Ramadan series?) For me, it offered an opportunity for guided introspecitve examination, Thanks Teresa… good job, I want more! went to the Sharmer film yesterday and despite that the quality of the film was very poor, I think it is very courageous peace of art! A pity that the cinema wasn’t full!!! Rarely one speaks open as that about drugs, police and other issues in our town. Sure the film was a point of view shot by the director and not representative.for all that is happening in Sharm. But – so what? !.I would love to see it again in 10 years time – I think it’s a wonderful insight in the varieties we have here. In all means!. i enjoyed the movie it ws easy viewing, but i felt each chapter could almost have been a mini movie in itself, in that many issues were raised but not looked at in depth, it did however provoke a lot of discussion amongst us and personally i would like it on dvd inorder to absorb it more fully!!! The film “Sharmer” shown yesterday in the Kiroseiz cinema tried to portray the beginning and development of Sharm El Sheikh from the time of the ending of the Israeli occupation until today. The question was “what is a Sharmer?” and to find out, there were interviews with local bedouins, Egyptians that have moved here, and foreigners that call Sharm El Sheikh their home. I especially liked the old footage of Sharm from the early 80’s and the interview with Rolf Schmidt from Sinai Divers, a true pioneer and a real Sharmer, in my opinion, who also see the negative development in Sharm today concerning massive construction of hotels and real estate, but with basically no development of the badly needed infrastructure (garbage, waste water, environmental protection etc.) – I think he hit the nail on the head when he said that this place is not “unlimited” in its development and we’re about to destroy it… On the funny side,the interviews with some of the mixed marriage couples – always good for a laugh (if it was not so sad..) . To summarize I have to say that I completey agree with people like Rolf, Ahmed Sherif, or Hesham Gabr who can truely call themselves “Sharmers”, because they are here for what this place originally stood for: a life style, and not a place for the quick buck and no concern about the implications! I am a Sharmer! very interesting movie! well done! Sharmers is an interesting movie that provides a picture of life in Sharm which aims to go deeper than the shiny surface of the sunny resort. It starts with the early days when Sharm became part of Egypt again in the early eighties which brings fascinating stories and pictures. The pick of the mixed couples determined the tone of much of the rest of the movie, which would have been entirely different if more successful relationships were chosen. However, the featured problems are real and Teresa Khalil deserves credit for bringing these and other real issues of life in Sharm under the attention of the people. I really enjoyed the film the only problem I had was on occasions the subtitals were too fast to read, but I enjoyed the subject and the humour as I understand some arabic. We will keep you updated here on further screenings, DVD sales etc.